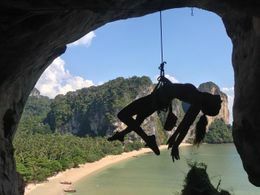 Ton Sai or Tonsai is a beach near Krabi in Thailand, offering a combination of inexpensive accommodation and great rock climbing routes that make it popular with both backpackers and climbers alike. Compared to neighboring Raileh and Ao Nang it's relatively rough around on the edges; in particular, the beach gets unsuitable for swimming and becomes quite rocky as the tide goes out. But this only happens for about ten days every moon period. The rest of the time the beach is suitable for swimming although not overly sanitary, take care and use antiseptic on all cuts. There's no easy overland access to Ton Sai, so all visitors arrive by boat. Rai Leh is a five minute longtail boat ride or a 20 minute walk. Longtails from Ao Nang to Rai Leh may also stop at Ton Sai. Boats between Ton Sai and Rai Leh generally don't run at night. If you're arriving from Krabi bus station you will need to get a taxi or tuk-tuk to Ao Nang Pier. The price should be around 60 baht. Expect the tuk-tuk to drive around a bit and pick up more people if it's not full, before heading towards Ao Nang Pier. From Krabi airport there is a shuttle bus that costs 150 baht. While they say it takes 45 minutes to Ao Nang Pier, expect it to take closer to 1.5+ hours. A taxi will take 45 minutes and cost 600 Baht. From there, share or charter a boat to Ton Sai. Boats run frequently from Ao Nang Pier to Ton Sai, but only when enough people have gathered and the boat is full with 8-12 people. In high season it can take upwards of 20 minutes to fill a boat depending on the time of the day. In low season it usually takes longer. Tickets costs 100 baht at the ticket stand at the southend of Ao Nang Pier. The price almost doubles after 18:00. After 18:00 it might be necessary to charter your own longtail while will cost 600-800 baht. The boat ride from Ao Nang Pier to Ton Sai takes 8-10 minutes and is very scenic. 1) At low tide you can walk around the rocky outcrop which separates Ton Sai from Rai Leh (20 minutes). 2) At high tide, go to the south end of Ton Sai Beach, walk the obvious path at the end of the beach, through the forest, up and over the rocky outcrop. You'll pop out on the north side of Rai Leh west. It is possible to use with route with a large pack if you take your time. However, when the tide is at it's peak you may need to walk through knee deep water on tonsai beach. (20 minutes). 3) The least used option is a longer trail through the Jungle. Walk away from Ton Sai Beach along the road where all the bungalows and resorts are. When you get to Wee's Climbing School, turn east and continue on the road uphill. Eventually you'll pass all the bungalows. Continue on the obvious path and you will eventually pop out on Rai Leh east near the Diamond Cave area (50 minutes). Although longer, this trail is smoother and easier to walk than the shorter one, much of it passes through undeveloped rain forest. Be careful of hanging power cables that sometimes crisscross the track. None of these options are possible at night without a flashlight/torch, and the jungle paths can be slippery and treacherous after the rain. The only way to get around Ton Sai is on foot. The beach and the main road act as the primary throughfares in the area. It may take five minutes or less to cover the entire area. During heavy rains, the dirt road becomes muddy and treacherous. Ton Sai is more of an activity kind of place, rather than sights. It is worth visiting the Phra Nang shrine on Phra Nang beach, which is either a 30 min walk away or a 20 min kayak. Thai women come here in the hope of increasing their fertility, and the shrine is adorned with wooden penises. Quite a sight! Another sight worth visiting is the lagoon. 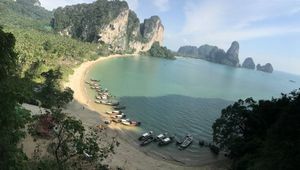 Located on the way to Phra Nang Beach, a path off to the left of the main track leads steeply up to a landlocked lagoon. Takes some scrambling to get there, but surrounded by beautiful cliffs and perfect for a dip. Only worth visiting when the tide is high. The pool is salt water and empties out at low tide. At the far end of Phra Nang Beach (near Escher wall) there is a cave which is the access point to a beautiful viewpoint of Ton Sai and West Rai Leh. It is an easy climb up 4 bamboo ladders, but take a torch as its pitch black in the cave. Breathtaking views that are definitely worth the the climb. Basecamp Tonsai (Wee's Rock Climbing School) . Professional variety of climbing courses. Course prices range from 800 baht for intro courses to 9.000 baht for five day advanced courses. Also the pioneer of deep water soloing trips. Their gear shop has the best selection, plus they publish the only complete climbing guidebook for the area. 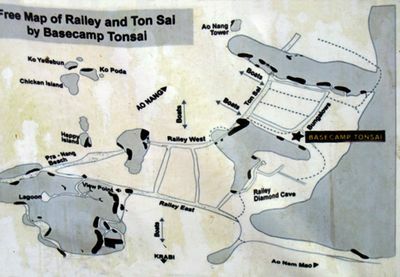 Helpful with info on Ton Sai. Get a free map. 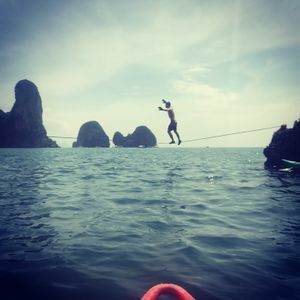 The first climbing shop on Ton Sai Beach, The Rock Shop  is a locally-owned and operated climbing shop that provides courses, gear rental, private guides, and guide services. Courses run from 800 baht for a half day to 5,000 baht for a 3-day course including course materials. All courses are all-inclusive. Guides are experienced and professional, competing for the Thai National Team throughout Asia. The Rock Shop also produces a climbing guide book, The Pocket Guide, Thailand Sport Climbing available at several shops in Ton Sai, Rai Leh, and Ao Nang for 800 baht. If you want to climb independently, its easy to either rent gear from one of the shops, or bring your own. Shops usually give you a package of a guidebook, 14 quickdraws, a 60 m rope, 2 harnesses, 2 chalk bags, and 2 pairs of shoes. This usually costs around 800 baht. Its also very easy to meet people if you're looking for a partner, so don't be afraid to just turn up alone, but do be careful about who you climb with. 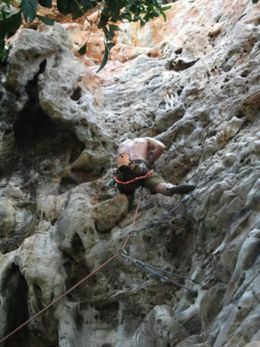 Almost all the routes are sport climbs on limestone rock, and are usually well protected. However, because of the close proximity to the sea the bolts tend to rust, so its worth sticking to new or rebolted routes. There are some climbs that are entirely protected by slings and sometimes these are worn through, so bring some extra slings or buy some there. You can also buy an excellent guidebook for the whole of Thailand at any of the climbing shops. It has dates and safety ratings for each climb, which is very useful. Be aware of local copies with inaccurate info. The climbing is often athletic and overhanging. The rock quality varies depending on the crag, but its usually excellent and the rock formations are very impressive, lots of staligtites. There are some fantastic multi-pitches, and you are rewarded with brilliant views from the top. Some of these can be climbed with one 60 m rope, some of them need two. Some of the hardest climbs are concentrated along the beach, which also makes a great bouldering spot because the sand is soft to fall on. There is also a good bouldering cave that stays nice and dry if it rains. The best time to climb is probably during the winter months when its cooler, but it can get crowded, especially at Christmas. The rest of the year its either very hot or raining, and many places shut down in low season. However there are often windows of beautiful weather during the monsoon and the rock usually drys quickly. PhraNang Adventures  specializes in all inclusive custom packages. Offers camp and climb on Ko Lao Liang. Playing with fire -- Ton Sai could well be the world centre for fire tricks: light something on fire, twirl it in the air, that's the basic idea. A lot of climbers can be found on the beach during their rest days practising on the beach. Scuba Talent Dive Center, . The only dive centre on Ton Sai Beach will guide you to the underwater world. Share or charter a boat to nearby islands. Chicken Island is good for snorkelling. Rent kayaks from one of the bungalow operations along the beach and paddle around to Rai Leh or the beautiful Phra Nang Beach. Look out cave Next to the Freedom Bar, there is a bamboo ladder that climbs to a lookout point. Although the ladder is fairly safe, be cautious especially after the sun goes down. Massage There is a massage parlour at Mambo's, with a view of the beach. It's inexpensive, clean and the masseurs are good. They give you a cup of scented tea and biscuits after the massage, which takes place in a small open room with a few beds next to each other. There are very few shops in Ton Sai, and they are pricey (by Thai standards) as everything is brought in by boat. It's probably best to bring everything with you or make a trip to Krabi, which is a much larger town with better choices. However there are a few mini marts selling cold drinks, snacks, phone credits, and tacky clothing. There are several restaurants and bars on the beach and most bungalow operators have restaurants as well. Not all business have electricity all day long. A lot of climbers report food poisoning while in Ton Sai. Have a look at the overall cleanliness, or ask around where people got sick. The street vendors also make fantastic authentic Thai food. Try the mango with sticky rice or som tum (papaya salad). Cheap too!! Another popular choice is on the cement road. Start from the Ao Nang side of the beach, pass Viking Climber's shop, walk up 100m and it's on your left. Expect to be paying 2 times more than in other rural places. Mamas Chicken Kitchen,(Follow the Eastern dirt road up the hill, it will be on your right) The popular choice due to price, location, and a great grilled chicken. Will do "Thai style" if you ask them. Sells fresh banana bread for 70 baht per loaf. Sao Legacy,(On the west side of the beach, a few meters up the concrete road from the longtail stop. ), Best prices with the biggest plates. Expect a monster and delicious PadThai, Lad Naa or veggie burger for 80 baht, or a huge bowl of fruit with homemade yogurt and granola for breakfast for 60 baht. There are several bars on the beach, several of which (oddly enough) feature non-stop reggae music. You can even chill out with a "special" coffee or tea. A popular climber's hang out is Ton Sai Roof, at the east end of the beach, where the routes begin at the foot of Freedom Bar, another hot spot with glorious views of both the rock and the whole bay. The "Pyramid bar" offers real coffee for 50 baht (2013) and opens at 6:30am. It seems to be opening first in the morning. Pyramid bar is opposite "Basecamp Ton Saï", the climbing shop on the backroad (not the beach one). All accommodation is set off of the beach and tends to be of the bamboo bungalow variety, and a little more rustic (and certainly more affordable though prices have more than tripled over the past five years) than at Rai Leh. Rubbish piles and noisy generators are common nuisances but as Ton Sai has no mains electricity it is a necessary nuisance. Andaman Nature Resort - set well off the beach near the base of the cliffs. The basic bamboo bungalows are popular with budget travellers. The Andaman is largest collection of bungalows in Ton Sai. Rates are around 800 baht during the high season for a basic room with private bathroom. 100-150 baht during low season. 300 baht during March/April. Be wary with your valuables as break-ins have occured, even while guests are asleep in the room. Country Side Resort - set back behind the beach (follow the path up the hill from the Internet cafe, and take the right-hand fork by Wee's Climbing School - follow the signs), this set of 10 bungalows are comfortable and have views. During low season it is the best deal on Ton Sai, down to 150 baht. Air-con rooms are also available but expensive and unnecessary because there is no electricity during the day. The downside, as elsewhere, is ongoing construction across the street - not a big intrusion since most days are spent at the beach, on the water, or on the side of a mountain. Mambo Bungalow - Right on the beach near the west side of Ton Sai this place offers basic bamboo bungalows. They have bathrooms and cold water showers for 500 baht in high season. The on-site restaurant has clean food and prices for food are ~70-100 baht for Thai food and ~200-300 baht for Western food. The staff is friendly. This is not a resort and you can expect your bungalow to be co-inhabited by a lot of other animals that fly, slither, crawl, or hop. They don't take bookings so the best bet is to show up at 10:00 and struggle to get a room during the check out period (check out is at 11:00). Pasook Bungalows, Jungle Hut, Mountain View, [email protected] (Get off the boat, walk up the path, first guest house). If you are looking for the place with a solid community and where all of the longtermers reside. Look no further than Pasook (or Jungle Hut and Mountain View are right next door and with the same management). These family run accommodation options are the best place to stay. For climbers, it is located right next to The Nest and Wild Kingdom, making the climbing so close you can literally roll out of bed and onto the rock. It is centrally located, close to the beach, bars and restaurants. But far enough from the bars to not be too noisy at night. Taking the boat around the mountains back to Ao Nang can be problematic in the evening as not many people are leaving Tonsai for Ao Nang. You will either get stuck paying more to leave with less than a full boat (900 baht total as of Feb 2018) or you will have to wait. You're best bet is to take the jungle trail to Rai Leh as more daytrippers are leaving from that beach to Ao Nang. This page was last edited on 21 February 2019, at 09:20.